Mackerel Sky is pleased to again host a Jewelry Trunk Show of Jim LeTerneau's distinctive jewelry. 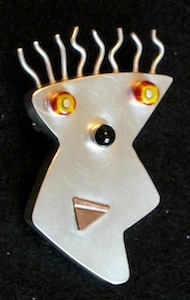 His work can generally be grouped in two categories: whimsical faces and people, and signature pendants and silver beads incorporated into pieces with semi-precious stones. This is a good excuse to begin the browse for the holidays.